The summer season is finally here, and it’s almost time for the long summer break from school. Summer brings warm weather, picnics, barbeques, swimming, and time for lots of outdoor activities. 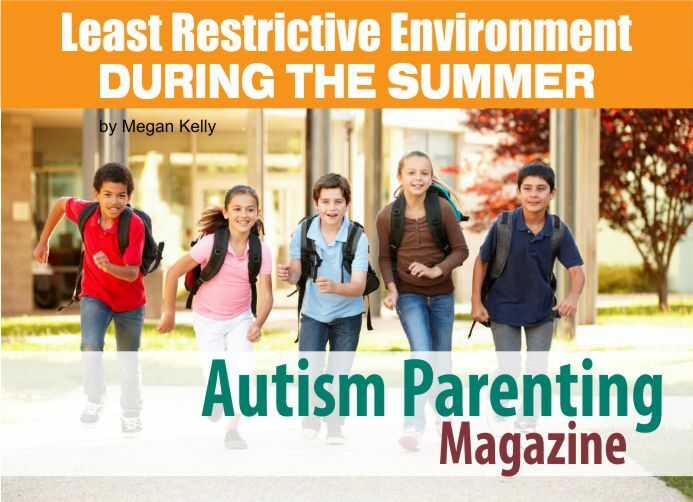 Despite all the fun, and pleasant things about summer, there is also the fact that the summer break from school can cause major disruptions for some children with autism. Many autistic children thrive on a routine that remains as unchangeable, and stable as possible. A few months off from school changes their daily routine drastically. Parents often voice concerns about whether or not their child is eligible for summer school, what the summer school’s curriculum is, and whether or not their child will be able to socialize with their peers during the summer break. They also worry about their child regressing during their long absence from school, and how detrimental this regression will be to the child’s education, and development. Although the long breaks from school cause most children to experience setbacks in their education to some degree, neurotypical children can usually get back on track relatively soon after returning back to school in September. However, for many children with autism, this is not the case. Often these children can take anywhere from twenty to sixty days to get back on track to where they were in their education before summer break. Because of this, school districts offer ESY (extended school year) programs, and services that run through part of, or all of the summer. The purpose of these programs is to provide a stable environment for children where they can continue their education through the summer, helping to eliminate setbacks, continuing to promote positive development, and allowing children to socialize, and interact with their peers. The programs should also be designed to follow LRE (least restrictive environment), such as providing an ESY program that integrates both disabled, and non-disabled children in the same environment, particularly if that is the setting that the child with a disability is a part of during the regular school year. In April of this year the parents of a five year old boy took the school district of the town they lived in to court (T.M. Vs Cornwall Central School District). The boy had qualified for ESY services, and the school he attended wanted to place him in a self-contained special education classroom for the summer. The boy’s parents wanted him in a mainstream classroom with other students. The school said that they could not provide this, as they did not offer a mainstream, general education summer program. They also stated that LRE requirements did not apply to summer school programs. The boy’s parents found this unacceptable, and so they enrolled him in an integrated program at a private school. They then took Cornwall Central School District to court, seeking reimbursement for the cost of the private school tuition, which they said they had been forced to send their son to, due to Cornwall’s ESY program failing to meet the requirements to be as least restrictive as possible. This court decision changes the way that school districts build their curriculum’s, and design their ESY programs. Schools will now have to consider how they can provide the least restrictive environment possible in their ESY programs, just as they must consider it for the regular school year. ESY services that include LRE, and if necessary integrated settings, must be provided to any child with an IEP (individualized education program) that qualifies for ESY, and is part of an integrated setting during the regular school year. 1- Is this a student for whom the state mastery test checklist is completed? 2- Is this a student for whom progress is extremely slow and incremental? 3- Is this a student who requires 1:1 assistance for 3 or more hours of the school day? 4- Is this a student who has significant behavior/socialization/communication issues? 5- Is this a student whose academic curriculum is extremely different from same age peers? To find out the requirements and policies for ESY in your state, you can contact your states Department of Special Education.